Can Closing machines. Inspection of the seam hook formed by a Can Seamer. Judging the quality of the double seam formed by the Can Seamer is done by both visually inspecting the torn down seam profile as well as measuring the various dimensions. Variations owing to differences in tinplate thickness, temper and sealing compound weight are acceptable within prescribed limits. The first operation seaming roller curls the cover under the body flange to form a hook. The seam should be rounded at the bottom and in contact with the body of the can. If the seam is too tight, the bottom of the seam will be slightly flattened through it’s length. 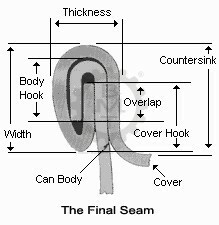 The second operation seaming roller flattens the seam, thus locking the hook formed by the first operation roller. The pressing also causes the compound to compress and fill up the gaps in the seam not occupied by metal. 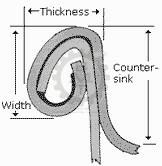 Excessive pressure may produce a defective seam since the extreme tightness will stretch the material and cause an increase in the width and outside diameter of the can resulting in leakage.This tightness could also produce slippage between the body and cover hooks, commonly called ‘unhooking’. Insufficient pressure will result in improper pressing and locking of the seam, causing leakage.